315 Properties Found. Page 1 of 27. Mandarin is a beautiful neighborhood in the southernmost portion of Jacksonville. Located entirely in Duval County, you’ll find homes for sale in just about every price range, both on the water by the St. Johns River and on the mainland. Known as being a “tropical paradise,” you’ll find parks, marinas, and more water views than any other area of Jacksonville. Once a citrus farming village, a freeze in the 1980s destroyed so much of the crop that many farmers sold off their land to developers, giving way to one of the most beautiful neighborhoods in Jacksonville. The heartbeat of Mandarin is San Jose Blvd or St. Augustine Rd both of which are lined with conveniences and commerce for residents to enjoy. The population is about 10,000 people. Mandarin homes for sale average a price between $280,000 and $330,000. It’s ranked in the top 5 places to buy a house and raise children in Jacksonville! Looking at Homes for Sale in Mandarin? Mandarin homes for sale run the gamut from original to recently remodeled and even brand new construction! With homes on the river and several creeks, waterfront is an option in more price points than you might find in other cities. Not only are there homes on the St. John's River, there are also homes located on Goodby's Creek. The creek, which winds through north Mandarin, is full of beautiful wildlife and allows for kayak and paddle boarding. 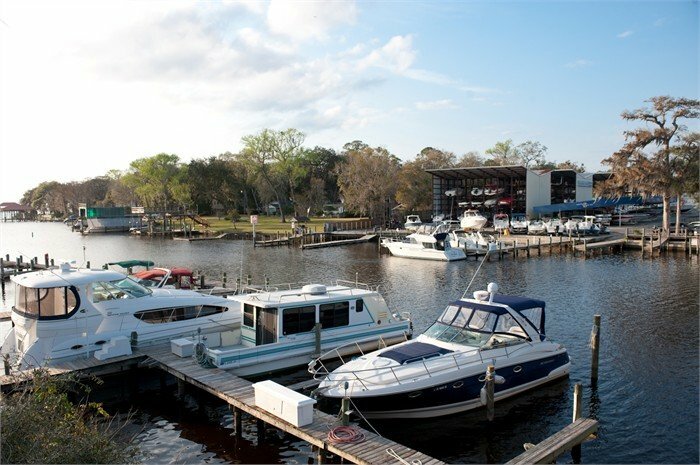 The Goodby's Boat Ramp and Boat Storage mean this area is a boater's dream! Houses for sale in Mandarin had a median listing price of around $330,000. The average number of days a home stays on the market is only 65, which means if you see a home for sale in Mandarin that you love? Jump on it! Some neighborhoods in Mandarin require a CDD or HOA fee, but most do not. Your Round Table Realtor can help you find a home with or without these fees if that’s important for you. The houses for sale in Mandarin are among parks, restaurants, wellness centers, and plenty of entertainment! You’re rarely more than a 15-minute drive to your next location when you live here. Check out local restaurants like Wicked Barley Brewing, One Night Taco Stand, and The Golden House if you’re looking for a place to eat that isn’t a chain (don’t worry, there are plenty of fabulous chain restaurants, too!). If you're new to the area and looking to connect with like-minded professionals, the Jacksonville Chamber of Commerce Mandarin Council has monthly breakfasts and luncheons! Members and guests are both welcome for a nominal fee. Breakfasts are hosted by Jumpin' Jax House of food and lunches are hosted by Bonefish Grill. Both of these restaurants are treasured eateries within the Mandarin area! Mandarin Park, Chuck Rogers Field, Alberts Field, Walter Jones Park, and Pickwick Park are all surrounded by beautiful Mandarin houses for sale. Mandarin park even has a boat ramp! Just up the road at Goodby’s Creek is another boat and kayak launch. Loscoe Park is a beautiful place for a picnic, BBQ, or a day on the playground! The Autobahn Indoor Speedway and The Edge Rock Climbing gym are both fun-filled adventures for the entire family! Check out the multiple break-out style rooms, as well as the two movie theatres nearby. You’ll enjoy The Comedy Zone if stand-up is your bag, as their constant stream of new comedians keeps things fresh! With plenty of doctors, massage therapists, chiropractors, and nutritionists, this neighborhood offers wellness routines for just about anyone. Add in the local and chain gyms, as wells yoga and pilates centers, and there’s no reason you can’t find a workout activity to suit your needs. Duval County Public Schools offer an excellent education, with magnet and charter schools available all around the area. There are also plenty of private schools to choose from if that’s what you prefer, including the world-renowned private Bolles school! With over 170 schools, you won’t be lacking in education options! Nearby you’ll find Loretto Elementary, Mandarin Middle, and Mandarin High Schools. Greenland Pines, San Jose Academy, and River City Science Academy are all excellent charter schools. And, of course, private schools like The Bolles School, Jacksonville Country Day School, and San Jose Episcopal are a few of the private schools in the area. Visit the Subdivisions page to see just some of the communities located in the Mandarin area.